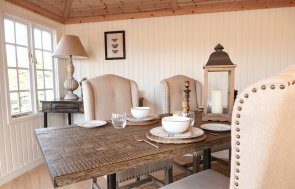 Set into a corner, overlooking the garden, this 3.0 x 3.0m Weybourne Summerhouse has been installed in our customer’s garden in Saxmundham, Suffolk to use as a pretty writing room, surrounded by their country garden to draw inspiration from. Situated away from the noise and bustle of the home, this Weybourne will offer a dedicated space to allow the customer to work from through the year, with its insulation in the walls and ceiling, and an electrical pack to provide light, heat and power. The Weybourne has been designed to be a specific shape to allow it to fit comfortably into a corner, which is very helpful for customers with small, or awkwardly shaped gardens, as they take up less room, and make the space look tidier. Grey slate effect tiles have been used on the roof, offering a smart, practical and highly durable roofing material, as it has a limited 50 year warranty. 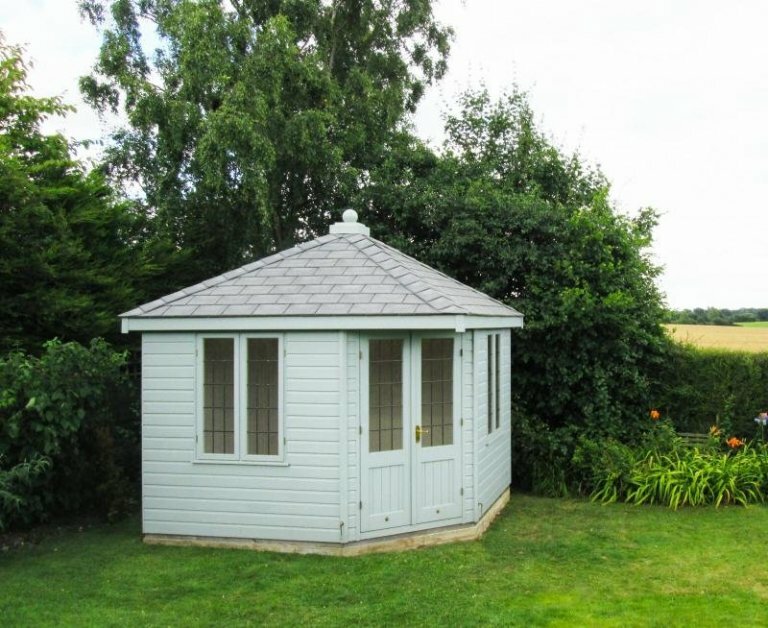 Leaded windows offer a traditional element to the design, and the summerhouse has been painted in the Valtti paint colour, Verdigris, which is a natural green/blue colour that suits the customer’s garden very nicely. As well as the insulation and electric pack on the inside, there is also painted matchboard lining on the walls and ceiling in Ivory, which gives a light, bright finish. 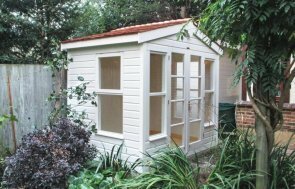 If you would like an attractive garden building for use as a hobby room or office that you can also use throughout the year, please peruse our Summerhouse, Garden Studio and Garden Room ranges to view our varied array of designs. For more information, please contact us online or call us on 01760 444229 and we will more than happily go through your requirements with you.